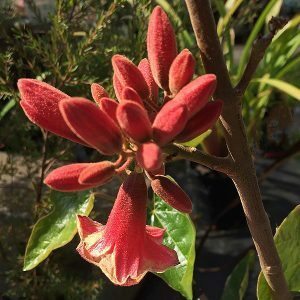 A small tree from South East Queensland, Brachychiton bidwillii is commonly called the ‘Little Kurrajong’. Reaching around 4 metres in height, often smaller, it features large clusters of pink to red flowers in summer. This is a deciduous native tree, slow growing at first, however Brachychiton bidwillii will flower at an early age, as it matures flower production become more prolific with large clusters of flowers almost covering the tree. The flowers are large on good specimens, and an attractive bell shape. They form in large clusters, increasing in size as the tree matures. Used in the garden as a feature tree and also useful a a small shade tree. A number of forms are available, some with larger flowers than others. Flower colour varies from pink which often goes under the name of ‘Beau Bells’ to red sometimes called ‘Large Red’. It is the larger growing species, Brachychiton populneus that is known as the ‘Kurajong’. Although originally from S.E Queensland, this is a tree that grows well in a range of climates. It will grow well in gardens at least as far south as Melbourne. This is a frost resistant small tree and it has few pest to insect problems. Once established it is regarded as drought tolerant and thrives in full sun. A humus rich well drained soil is best and a light mulch around the root zone in spring is beneficial. Height – To around 4 metres sometimes taller. Foliage – Deep green and maple like in shape. Although Brachychiton bidwillii is naturally small growing it can be pruned. pruning will keep the tree smaller and also increase flower production.